In the X-Men multiverse, it is 1983 and that means more cold war threats, more period fashions which seem to mirror parodies and even more barking at the survival of the mutant race. Ever since First Class set the clock on the X-Men universe back into history and gave us Michael Fassbender and James McAvoy as Magneto and Professor X. They are the X-Men's main conflict, one runs a school for 'gifted youngsters', while the other gathers evil mutants to form some sort of brotherhood. And here, things have gotten even murkier. 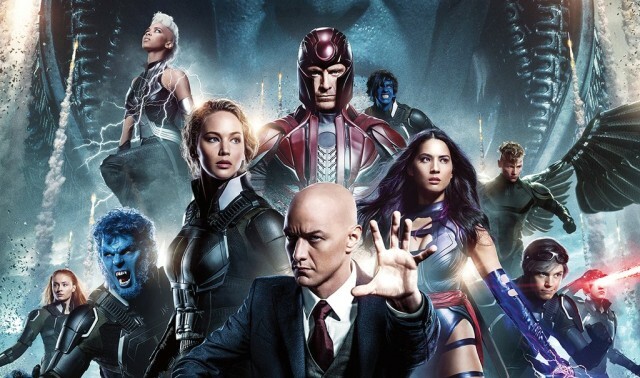 Now, the franchise's ballooning mass of mutants have to pick sides which depend less on cooperation or resistance and more on which guy's overbearing savour complex works best for you! X-Men Apocalypse sees director, Bryan Singer, the man who has given us the majority of the X-Men movies up to this point, giving us Magneto and Professor X who both have next-to-nothing in terms of screen time. While this version of Earth may be under threat from the nuclear theatrics of the Reagan administration and an Egyptian mutant, Apocalypse, played by the strange casting of Oscar Isaac but the film's main focus of right and wrong are seriously bubbled away. The pair get their own versions of heaven in the opening third of the movie. Magneto has returned to his home of Poland, married, had a daughter and living a quite life as a steelworker, while Xavier has got his school, he is training mutants and playing the part of an undergraduate crush object with his shaggy hair, English accent and blazer jacket rolled up to his elbows. Then everything really goes to pot. Both their ideal homes are torn away from them and yet both of them remain really impassive while assorted protégées and allies do all of the real leg work. Even Isaac, his face painfully looking pinned back under the make up and prosthetics, plays the villain as insecure. When he finally does go mano a mano with Xavier it is done in a dreamscape which looks just like Xavier's mansion. In recent months, films like Captain America: Civil War have offered us big and flashy superhuman feuds centred around ideology and force of will. But Apocalypse seems to say no to that and instead, gives us a movie which delivers borderline psychedelic displays of some serious super-powered insecurities. The thing to understand about Bryan Singer's X-Men movies is that superpowers are used more as super-fantasies. There is no moment in any of the other superhero movies which have come close to the 'Time in a Bottle' scene from Days of Future Past or older Magneto's escape from prison in X-Men 2. In Apocalypse, these effects cross into lines which mirror fear and insecurities. Magneto tears apart Auschwitz, using the bricks of the concentration camp to build an impossible future cityscape of archways. Then you have Nightcrawler who, while wearing a red and black Thriller jacket, can teleport away as every awkward teenager wishes they could do at some point. And then there is Quicksilver, someone who is still living a life in his mother's basement, finding the time to save bystanders, eat pizza and listen to Eurhythmics. In the comics, Apocalypse has the power to change his size and shape, here, he can only do it in the dreamscape.